Like that example set in that great novel about a racer and his dog, Flahute and I enjoyed watching the video of Saturday's Het Nieuwsblad. There is truly an art of racing in the rain. And nowhere better than Gent-Gent, the Omloop Het Volk (now called Het Nieuwsblad) to demonstrate it. The secret recipe of this art? Simple. Run a classic race, without radios. Throw in cobbles, and enough rain to send Noah looking for an ark. Sit back with a Leffe, and let the great racing commence. Saturday ding-dong finale battle between Flecha and Langeveld reminded me a lot of two great Het Volks from years gone by. The first was back in 1981, held in a cold rainy deluge. Jan Raas (TI - Raleigh) won a sprint from a group of four, which included his teammate Frank Hoste, Jean Luc Vandenbroucke (La Redoute), and Gilbert Duclos Lassalle (Peugeot-Esso). It was a day you'd have wished you had beaver pelt for skin. Or maybe would have contemplating racing in a scuba wet suit. Ever wonder what it's really like to ride a Tour? C'mon, admit it. Most of us amateurs, from the time we first stomp on pedals in anger, from that first adrenaline rush riding in a peloton, that sound of whirring chains and wind, incubates a dream of riding a 'Tour'. A real stage race, one longer than the 3 or 4 day long weekend versions available nowadays. A race with commissaires, run from town to town in a place where the road signs are in a foreign language. A race with stages measured in kilometers, one where words like revitaillement, grimpeur, hors-delai and voiture balai are quickly added to your daily vocabulary. 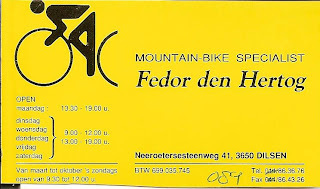 One February day in 1993, I was standing in the ProFlex mountain bike booth at the Brussels bicycle show, showing a new range of full-suspension mountain bikes to an unending stream of Belgian fietsenhandlers. Most dealers would typically come in, ask for the catalog and pricing, and be gone. But one visitor from that day stayed with me all these years. He was a graying gentleman, about 6 feet tall, looking like he was pushing 50, reed thin, with the drawn look of the still-active cyclist about him. His English was perfect and we struck up a conversation. He was more interested than most about our bikes, you could tell by his questions. He was quiet, unassuming. Direct but polite. At the end of our talk we shook hands and exchanged cards. I read the name. Fedor Den Hertog. And the penny dropped. Photos of the day: Jongeren op de Muur. Here's my antidote for a week of news filled by dopes like Riccardo Ricco: Some images taken at De Ronde van Vlaanderen in 2006 while waiting for the race to arrive on the Muur de Geraardsbergen. A pack of young cyclists in a nieuwelingen event, some riding alongside supportive dads, tackling the same climb Boonen and Hoste would fly up a few hours later. The sudden impromptu appearance of these earnest, wide-eyed youngsters will always stay with me as the most poignant memory of that day. A most fitting, perfect expression of the endless life-cycle of wielersport. Flowers were blooming on the pave as well as along the roadside that beautiful spring afternoon. 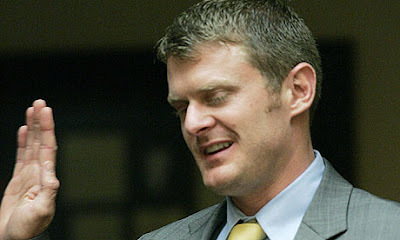 I remember thinking that somewhere up there, Gus van Cauwenberghe was looking down on his old hometown, smiling. 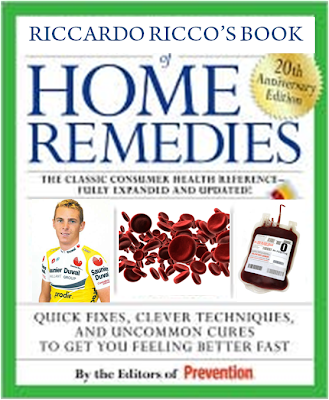 The highly prophetic Marco Pinotti, in a Gazzetta Dello Sport interview. I know, I know. A few days ago, I said I wouldn't judge Floyd. Today however, I've changed my mind. I think I will pass judgement. On one Riccardo Ricco. His Vacansoleil team is still reserving comment, saying it's a 'rumor'. Well, its all over the news today boys. And it went down a few days ago now, so stop hiding behind safe words, put down the Heineken and get your DS and PR guy to Modena to check it out. And then do the right thing. 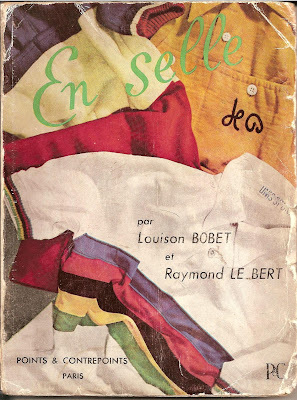 'How to' book review: "En Selle"
Ah, self help books. No I'm not talking Oprah, Dr. Phil or Tony Robbins. We cyclists have our own particular versions. I might have the dubious distinction of being the guy who's read 'em all. (Some who know me might say none of it seems to sink in!) So yesterday, seeing as it was pouring and sleeting on an accumulated foot and a half of snow which prevented any meaningful road miles, and after the kind of cabin fever only a 90 minute windtrainer session can engender, I figured a starting a review series of 'the greats' how-to-guides to cycling' was in order, and started this post. Today was a clear and windy 45 degrees, and Dr. Brad and I got out for three and a half hours of aquaplaning through the melting snow and slush. Ice road trucker style big ring zone 2 fest... nice! Felt great to finally see tarmac again, even if most of it was under an inch of water. Love long winter rides in flahute weather. 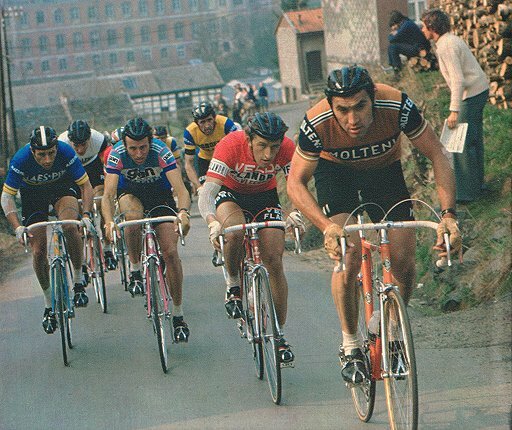 Photo of the day: Merckx and company, 1976. What happened after "A Sunday in Hell?" Another day, another race. This one might be Fleche Wallonne, or Liege Bastonge Liege. Not sure. Some climb in the Ardennes. It's a race scenario we've all lived. The guy at the front pushes it on a steep hill, and the rest are forced to lift the tempo. Merckx, Maertens, Zoetemelk, Dierickx, Thurau, Verbeeck. Godefroot. Each a star with plenty of references to justify his place at the front of this particular pecking order. None of those references count in this particular moment, in this particular race. A simple still photo that captures the essence of cycle racing. The best part of this photo is the faces. Each a different study in intense effort and withdrawn-into-self concentration. What's an honest man worth? "Of more worth is one honest man to society and in the sight of God, than all the crowned ruffians that ever lived." Photo of the day: Wintertrainen. "If you have to shovel snow off your windtrainer before riding it...then you just might be a Flahute." Poor Matt. He just couldn't take it anymore. I'm not sure whether it was the Belgian beer last week, the incessant snowfall (still coming down) or pandemic-winter-in-a-bike-shop-cabin fever.